Last weekend on the way to Mankele I discovered a very noticable power decrease when driving up hills with the car's lights are on. Switch lights off, car goes. Switched lights off, car won't go. 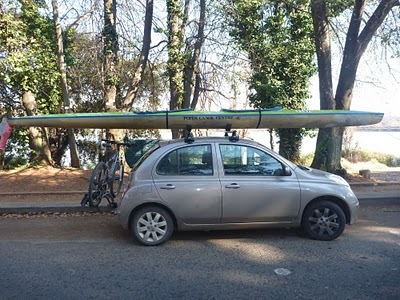 I took the Micra to the Nissan-shop; they discovered that the power-reduction does not happen when the Thule lightbar (model 976) is unplugged. My Micra (and all other small cars) was not designed to pull things, so the wiring does not have feedback-protection from single-contact light units. The single-contact lightbar feeds back and interferes with the ABS pump. This could damage the abs pump (among other things). Bigger cars dont have this problem, as they have built-in feedback-protection. It's a Thule ride-on. I guess I could drive around without the lightbar (i have been for a while) - but the rack makes the car quite a bit longer - probably 1 1/2 metres. After dark I'd like other cars to know there's something between my car's taillights and their front bumpers. The electrician that worked on the car said for R900 he could convert the lightbar to 'double-contact' ..... but i do not want to spend the money only for them to afterwards realise that that wasn't the problem. I cant think that Thule could sell lightbars that would be a problem on (all?) small cars, though - it doesn't make sense? Surely there are other small cars that carry bicycles around - has anyone else experienced this with a Thule light bar on a small car? If I can find someone else who had this issue before, then at least i'll know that the electrician wasn't just guessing, and a different lightbar would in fact solve the problem. The electrician said any 'double contact light unit' would work fine. What brand of lightbar would be plug 'n play, i.e. which light bar can i buy off the shelve, plug in, and it will work?